Description: Popular floorplan. 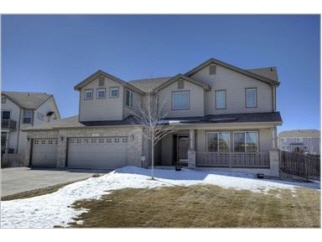 4 bed + loft on cul-de-sac. Gourmet kit w/42" upgraded cabs, granite, tile, dbl oven, micro, cooktop & pantry. Coved ceiling in dining rm. 2 sided fp in family rm/study. Tiled 5-pc mstr bath & amazing mountain views from master bdrm which features another fp. Private guest suite. Prof. Landscaping & oversized trex deck w/hot tub.